In 1526 the soldier-emperor Babur led his people out of Central Asia and founded the Mughal dynasty. This ushered in a period of court life in South Asia that was known for its opulence as much as it was for its literary culture, miniature paintings and monumental architecture. Although an Islamic dynasty, the Mughals were great patrons of both Muslim and Hindu artists, and painting was an important tool for projecting the imperial image. Babur (reigned 1526–1530) was presented as a warrior, adventurer and wise founder of the Mughal Empire. Akbar (1556–1605) portrayed himself as a patron of art and culture, while Jahangir (1605–1627) utilised religiously informed allegories, including the adoption of Christian imagery. However, it was not just the Mughals who were famed for their court culture in South Asia. The courts of the Deccan sultanates –Islamic kingdoms in southern India – the older Hindu Rajput courts of Udaipur, Jaipur, Jodhpur, and the hill kingdoms of northern India continued to wield tremendous political and military influence. The paintings and objects of this period reveal the magnificence of these courts, as well as the complexities of their etiquette and the hierarchies emplaced to instil the perception of the court. These Indian courts were in contact with the great empires of the Middle East, Europe, Asia and Africa who similarly shared a taste for luxury and fine artisanship. As hubs for patronage and international relations, courts acted as the conduit for cross-cultural artistic exchange. Within this colourful Indian painting, you can see the Mughal Emperor Jahangir holding a small European-style picture of the Virgin Mary. Jahangir can also be seen in the drawing by the great European artist Rembrandt. Many Mughal miniatures reached Europe through Dutch maritime trade. Rembrandt is known to have owned several of these, and used them as inspiration for his own work. The Virgin Mary in the Mughal portrait is probably based on paintings and icons brought by the first Jesuit missionaries who arrived in the Mughal court from the 1580s onwards. This portrait of the Mughal Emperor Jahangir (1569–1627), shows him holding an icon of the Virgin Mary, while a golden halo of light radiates around him. Poetic inscriptions, around the side of the painting, ask for strength and protection for Jahangir to face the surrounding darkness and rise to the challenges of kingship. Maryam (the Virgin Mary) occupies a prominent place among the women in the Qur’an and became an epithet for Mughal queens. This is a drawing of the Mughal Emperor Jahangir (reigned 1605–1627) copied by the celebrated Dutch artist Rembrandt. Courtly life was often the focus of Mughal miniature paintings, which fascinated Rembrandt. Jahangir is shown within his court seated on a divan dressed in his finery. Rembrandt has paid great attention to the Mughal clothing, but has altered the perspective to provide a greater sense of depth in keeping with European artistic style. The early Mughal emperors and their courts were constantly on the move and spent more time in lavish tented mobile palaces than the cities they founded. 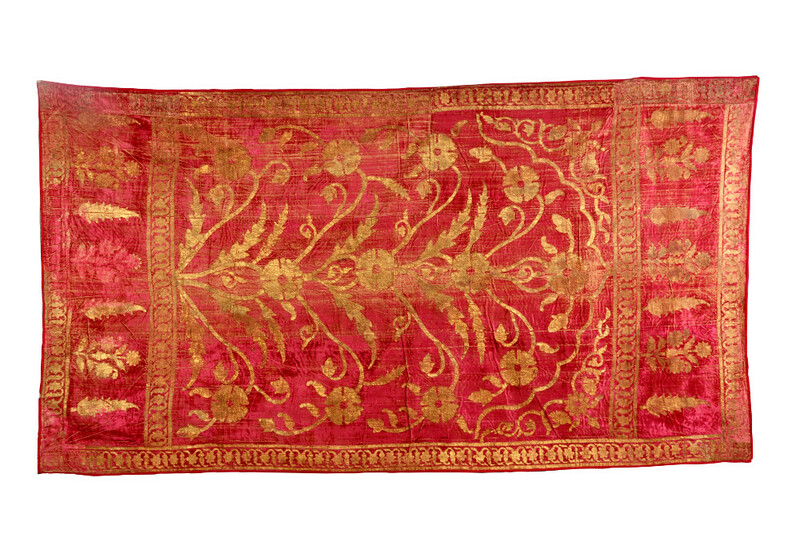 This panel probably comes from a tent made for Raja Jai Singh l (reigned 1611–67) of Amber, later known as Jaipur. The Jaipur court had a close association with the Mughals. The families intermarried, and innumerable gifts, books, and carpets were exchanged between both courts. 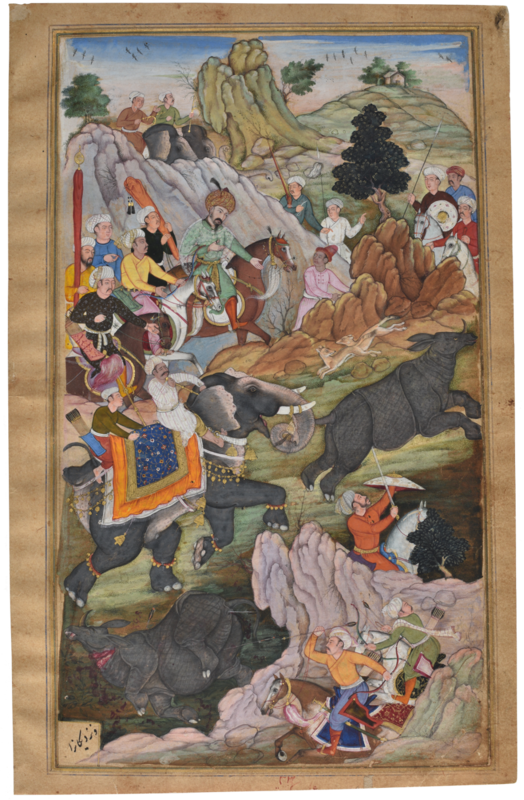 This painting shows Babur hunting rhinoceros near Peshawar on his fifth expedition in 1525. This provided the opportunity for Babur to satisfy his curiosity about what happens when an elephant and a rhino come face to face. He noted that the rhino retreated and that his young son Humayun who had never seen a rhino before was much entertained. The account comes from Babur’s autobiography – the Baburnama, but the paintings were made in the reign of his grandson Akbar (1556–1605). Zahir al-Din Muhammad Babur (1483–1530) founded the Mughal Empire in 1526. Having been deposed from his throne in Ferghana (in Uzbekistan), Babur had spent the larger part of his life in search of such an empire. This painting from the Baburnama shows Babur’s encampment, a veritable mobile palace, at Kohat in 1505, on his first incursion to the subcontinent from Central Asia. The painting depicts the feasts that followed his raid of Bannu when several local chieftains paid homage at his camp. The subject of the painting on this shield is Maharana Sangram Singh II – ruler of the Rajput court of Mewar from 1690 to 1734. He is shown practicing his archery, hunting tigers, and having amorous encounters in the forest, while the women of the court expectantly await his return. Messengers would carry a royal shield to allow them a safe and speedy passage, and in Rajput courts they had long been used as trays for royal gifts. The elegant dagger is of a type that was comfortably worn tucked in the sash-belt and could have been used by either a man or woman. This small ivory statuette might come from a lavish private temple of one of the Nayaka families. He holds a baku, a horn-shaped weapon that was commonly carried concealed in the sleeve. The Nayaka dynasties ruled a series of kingdoms across south India in the seventeenth century. Monumental portraits of Nayaka kings were placed in temple hallways where the worshipping public would note the devotion of the king and see him as also being blessed by the deity. This elegant ankusha (below) is used for controlling elephants either on foot or when mounted, but it is also a symbol of royalty in south India. The long curving ‘shamsher’ sword is a typical Mughal-style blade. Although the elaborate decoration and parrot-headed hilt is more like an eighteenth-century piece when many Mughal objects were received and reset in Rajput courts. The inscription on the collar of this piece of armour reads: ‘The personal garment of the emperor of lofty fortune, Akbar. Year (AH) 989’, which would equate with AD 1581. Swords, shields and armour were often gifted and passed on by the monarch to favoured members of the Mughal court. They were sometimes inscribed with the name of the king years later. Others were made at a later date in the style of a particular court to consciously invoke it. This painting depicts the military procession of the Golconda court of Abdullah Qutb Shah (reigned 1626–72) in the Deccan in south India. This is a public display of pomp and pageantry, with bearers of flags, incense-burners, and soldiers – some holding swords, some with lances and others with guns. Abdullah Qutb Shah famously surrendered his empire to the Mughals in 1636, rendering all this military pageantry slightly ironic. This painting depicts Maharana Shambhu Singh (reigned 1861–74), his ministers and their chosen horses taking part in Holi. Shambu Singh inherited the throne of Mewar when still a minor and a British political agent assumed the role of guiding him. Here, the king and his courtiers stand stationary at the left, they carry pouches of colour in the middle, which they toss into the air and catch up with to drench their horses on the right. This painting shows the fifteen-year-old bridegroom Aniruddha Chand being carried to his wedding in a palanquin. His father, Raja Sansar Chand Katoch (1765–1823), dressed in red robes and a striped turban, controlled a substantial part of what is now Himachal Pradesh and the bordering Punjab from his capital at Kangra. A figure riding an elephant throws coins towards onlookers, buying goodwill, spreading cheer amongst the people of Kangra who will forever remember the wedding of their crown prince. Balwant Singh, ruler of the Rajput Court of Jasrota, is shown here stealthily hunting a bird, perhaps a duck or a bustard, concealing himself behind a bull, which is held by its minder. Rather than just assuming the role of an artist who serves the interests of the court, Nainsukh’s (about 1710–1778) talent and insight renders his patron Balwant Singh more of a muse. Here, he captures the intensity or Balwant Singh’s gaze as he draws up his gun to shoot. The Mughals, the Ottomans and the Safavids were the three great Muslim empires that ruled South Asia and the Middle East. Elsewhere, sophisticated courts were at the centre of the two largest empires of the time: Ming China and the Spanish Empire. Ming China was the most populous state in the world. Its emperor lived in the new capital the Forbidden City in Beijing, but the sheer scale of the empire meant it was ruled from regional princely courts and by a well-organised bureaucracy. Spain had conquered large parts of the Americas and the Philippines, making it geographically the largest empire in the world. Ships sailing across the Atlantic and the Pacific connected the courts of Africa, Asia, Europe and the Americas. This painting depicts a royal picnic in which a Safavid prince is attended by members of his court. Musicians play while youths serve wine in a night-time scene, surrounded by mountains, trees and a river. The prince, identified by his fur-lined jacket, may be Shah ‘Abbas II (reigned 1642–66). A contemporary of the Mughal Emperor Shah Jahan, Shah ‘Abbas II ascended the throne when he was only ten-years old. Based in Isfahan, the Safavids were one of the most powerful dynasties of Iran. The Ottoman Empire reached its height of power during the sixteenth and seventeenth centuries. Thanks to an efficient and far-reaching bureaucracy, the Ottomans maintained control over territories stretching from Eastern Europe and North Africa to the Caucasus for over 200 years. This painting shows the sadrazam or grand vazir, the most important official in the Ottoman court and the direct representative of the sultan. The grand vazir was, in effect, the prime minister of the Ottoman court. This painting, copied from a famous Ming scroll, is an idealised portrayal of Chinese courtly life. It depicts a spring morning in the Han Palace. Wearing traditional Ming costumes, the women of the court are shown at their leisure, playing musical instruments, dancing, having their portraits made and playing games. Aside from the empress, many women occupied the court as courtesans or servants. The concubines were often sent to the imperial court from surrounding states, like Mongolia and Korea. These paintings illustrate scenes from a book originally published in Ming China and brought to Japan in 1606. The book contained stories of virtuous and wicked Chinese emperors. The first painting tells the story of Emperor Yōdai who had great fortune. It is a critique on leaving too much money to your descendants, prompting them to live a life of excessive luxury. The second painting is an example of a virtuous emperor. It shows a Han emperor who as a child studied alongside a boy of humble background. In adulthood, the emperor located the man, and the two rekindled their friendship. Seated under a canopy, the Holy Roman Emperor Maximilian I (1493–1519) is shown here giving audience to a foreign ambassador, who kneels in front of him. Members of his embassy are drawn spilling out of a doorway on the right, and in the background an army marches into a fortified city. Born in present-day Austria, Maximilian I belonged to the Royal House of Habsburg, one of the most prominent and opulent royal houses in Europe. This is an example of the type of cups the rich drank wine from in England in the early 1600s. The gold cup takes the form of an acorn on a twisted stem resembling a tree-trunk. Gold cups were usually melted down for their metal content or when fashion changed. This one only survived as it was given to the church after which it is named, for use as communion cup in the eighteenth century. Queen Elizabeth I (1558–1603) was the last reigning monarch of the Tudor dynasty, which ruled England, Wales and Ireland from 1485. Shown facing left and wearing a crown, this jewel is one of the finest cameo portraits of the Queen. 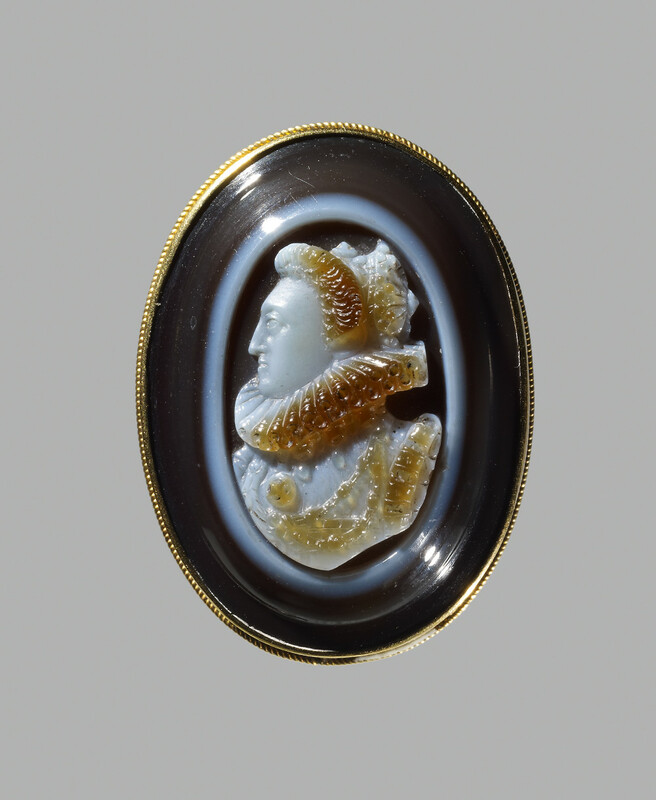 Cameos such as this were given as presents from the Queen to important members of her court or foreign dignitaries. It is made of onyx, a precious material imported to Europe. This portrait is inscribed with the name of Malik Ambar (1548–1626), who was born in Ethiopia and was sold into slavery as a young boy. He was brought by his owner to the Ahmadnagar Sultanate in the Deccan, where he was freed and had an illustrious career in the military. He became a thorn in the side of the Mughals and rose to become prime minister and general of Ahmadnagar. The Kingdom of Benin, in modern-day Nigeria, reached the height of its power in the late 1500s. Its capital in Benin City was ruled by an Oba (king), regarded as the Edo people’s highest spiritual and political authority. The Oba was also the head of government. On this plaque, the Oba stands in the centre surrounded by four attendants. The textured cloth around his waist may represent imported Indian fabric, which was brought to West Africa by Portuguese traders. Royal courts in both South Asia and Europe were often at the centre of intellectual movements with rulers acting as patrons to mathematicians, astronomers and theologians. Astrolabes were popular in Islamic courts from the ninth century onwards. They are astronomical instruments modelled on the heavens, which allowed an understanding of navigation, telling time, surveying land and also astrology. Globes were also popular in South Asian royal courts and the Mughal Emperor Jahangir was often portrayed either holding a globe or placing his feet on one. During the sixteenth century, Europe experienced the Scientific Revolution, a period of scientific exploration and discovery which marked the beginning of modern science. The courts were at the centre of this intellectual movement with rulers acting as patrons to mathematicians, astronomers and theologians. This elaborate survey set could be used to measure bearings, elevations and distances, for making topographical surveys and setting-out construction works from plans. Its decoration suggests it was commissioned as a luxury piece.